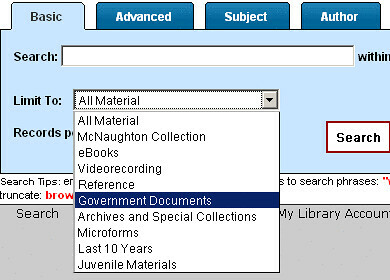 There are two ways to search for government documents in the library: the Library Catalog and OneSearch. 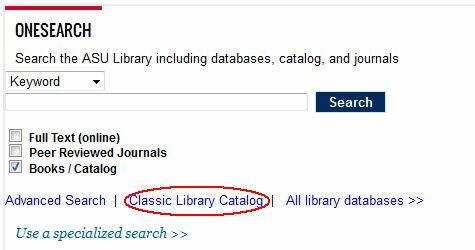 The main advantage of the Library Catalog is that you can limit your search before you search. OneSearch only allows you to limit to government documents after you search; however, most find it easier to use. Another advantage of using the OneSearch is that you can specify and choose between online government documents and those physically in the library. Both catalogs are available through the library home page. Simply go to the website and click on the appropriate link. For more help using the catalog, visit our Library Catalog or OneSearch guides or ask for help at the information desk. One way to search for just government documents in the library is to use the Library Catalog. The Library Catalog defaults to the basic search. From here, select "Government Documents" from the "Limit To:" drop down menu. 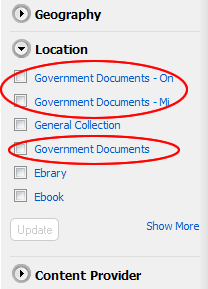 In the advanced search page, choose "Government Documents" from the "Location" drop down menu. OneSearch is easier to search, but you must perform your search then limit your results. First, begin by performing your search. You will receive a list of results that contain all type of material. Second, click on "Location" on the left-hand side of the screen. This will expand the list and allow you to choose Government Documents. Note: The options under the "Location" heading are in order by number of results. If you don't see any Government Documents, try clicking the "Show More" link for a full list of options. Government publications are everywhere in the library. You will find some in the reference collection, some in periodicals, some in microfiche and even some in Archives and Special Collections; however, most of the documents will be shelved in the documents collection on the third floor. When searching for your documents, you may notice that the call number looks a little different than the rest of the call numbers in the library. This is because our document collection is arranged in SuDoc order -- that is, the Superintendent of Documents classification system. Generally, the beginning of the call number dictates which agency put out the document. For example, call numbers starting with A are from the Department of Agriculture and those starting with D are from the Department of Defense. All Congressional documents start with the letter Y. The biggest difference with SuDocs and "regular" call numbers is that SuDocs don't use decimals. The numbers that appear after the decimal point should be treated as whole numbers.